Polish is NOT the hardest language in the world! Polish is the campion! Photo of Paweł Wolak by M. Zurawicz. All over the internet, people are saying that Polish is the hardest language in the world. Especially Polish people! The perceived difficulty of Polish is a point of national pride. Most Polish people are simply amazed when a foreign can speak any Polish at all. My Polish is good, but not perfect. Yet I constantly get over-the-top compliments about it! If Polish is "the hardest language in the world" I must be a super genius, right? I wish! I'd love to believe that but it simply isn't true. Polish is NOT the hardest language in the world! Read more to find out why. I have a theory, that all languages are equally hard. But here is my theory: For everything that is more difficult in a given language, something gets easier. In Polish there are all those cases, but there are only five verb tenses (compare to English's sixteen!) and no articles. In Chinese there are tones, but (from what I understand, I don't speak Chinese) there are NO verb conjugations or cases or gender at all (there is only one word representing "he", "she" and "it"). Depending on your native language, some languages can be easier for you. That's not because the language is actually easier, it's because you are cheating! You are bringing things from your native language that still apply and using them in the new language. If you come from a language that already has cases (for example, Russian), you'll be able to catch on to those quicker. But you will also have to be careful not to use Russian grammar rules in Polish! Also, most European languages share a lot of vocabulary. Much of it historically comes from Latin or French, these days there are a lot of words imported from English. Speaking English will make some Polish vocabulary easier. But again, this isn't because the language is easier. It's because of the unfair advantage you brought with you. Everything doesn't matter, not all at once! I've talked to many foreigners learning Polish. They do tend to complain about how hard it is to get the cases right. They try to do so much mental mathematics to speak and understand them! Much of time, you can figure out the meaning without the case, using other clues in the sentence. Namely there's prepositions and context. Of course, there are a few tricky situations with prepositions, for example: "z Krakowa" (from Cracow) and "z Krakowem" (with Cracow), but I'd say its rare when both could make sense in the same context. If you say the wrong case, there are very few situations where the person listening will think you meant to say something different than you intended. Certain situations require that a certain case is used. For example, the preposition "od" is always followed by Genitive case. If you accidentally used Instrumental case, it would be gramatically wrong, but it won't change the meaning of the sentence. The person listening will simply assume you meant to use the Genitive. Yes, you should strive to speak correctly. But the cases aren't as critical as people make them out to be. Relax! Anyone can learn them in time. But you have to speak badly, before you can speak well! Don't worry about all this hard grammar. Eventually, your brain will internalize it, and you will be able to use the cases without thinking. Every Polish child learns Polish and so will you! All it takes is time and motivation. The brain is designed to learn languages, it one of our basic human functions. Every single Polish child, even the not-so bright ones, learn Polish. The same could be said for any human language. So how can one language really be harder than the others? If a nation, wich is millions of people, uses language it is foolish to say "it's impossible". Learning grammar is a good way to improve ones understanding of language and can be fun itself but children who speak polish don't know concepts of verbs an nouns yet they use it. Rules of grammar were written to describe what was already there. I also want to improve my english and polish skills before going back to college in october. Thanks for the comment! I'm glad I'm not the only one who thinks this way. ;-) Good luck with your language studies! well the problem is that 80% of polish people cant get their own language right. it is hard to understand it. you might think you can speak in that lanvuage, others will thinks so, but you all will be wrong. thats the difference betweet polish and other languages. it might look easy but it really isnt at all... dont know if youre polish or not but from what I know they even have them agreements on how to say something correctly and all them "pisze" "jest napisane". Its really confusing language and its also easy to offend somebody with a small mistake. I know it cause I did it a lot of time even though my polish is pretty good. Many a language are discarded being hard to learn. But, for a dissecting mind, no language is hard enough to learn. It is the motivation, devotion and love for a language that differentiate it from the die-hard. I appreciate your point of view towards Polish language. "The perceived difficulty of Polish is a point of national pride." I'm Polish, and I definitely don't agree with You, I'm 19 years old and still can't speak perfect Polish, but it only took me 2 years to learn English. I have never heard Polish person brag about Polish language, and reading your article made me feel like reading thoughts of a very upset person. I dont know what is the hardest language in the world there are undiscovered languages which may be amazingly hard to learn, but I think that people who labelled Polish as most difficult, considered the fact that if an average person who is learning two languages would take longer to learn Polish than e.g Chinese. I have met a lot of English speaking people who can speak Chinese or Japaneese but never Polish, maybe few basic words. I guess it depends on what you mean by "perfect Polish". According to linguists, as a native speaker of Polish, you speak perfect Polish by definition! If you mean that your language doesn't perfectly match the standard dialect, that's an entirely different issue. I wrote an article about dialects and errors as it relates to English. And while it's possible to learn English (or Polish or any other language) to a very proficient level in two years, I doubt that you speak "perfect English". :-) There is a diminishing returns in language learning. At first you learn very quickly. You can get to 80-90% in two years. But to cross that last 10-20% could take 10 years! I think the reason you haven't personally met many foreigners who speak good Polish is because not that many people study it. Overally, there are always way more beginners in any language. But if a lot of people study a particular language, you start to see more and more people at higher levels. When we were in Poland, I knew many foreigners who spoke extremely good Polish -- much, much, MUCH better than me! Of course, they have all lived in Poland for 10+ years. Anyway, I don't mean to insult you or the Polish language! I love Polish and I want more people to learn it. But if everyone goes around saying "it's the hardest language" and "you will never learn it" than people won't want to. What can we do to inspire more people to start learning Polish? I think what you said is not true- that being Polish means, by definition, speaking perfect Polish . I am Polish and I think I was pretty good about speaking/writing my language, but there are many instances when I am not sure about the correct way of saying certain things. I found English and German extremely easy compared to Polish. According to the definition used by linguists it is! :-) Linguistics is descriptive (this is how the language is used) not prescriptive (this is how the language should be used). Of course, there are lots of different perspectives and definitions. Teachers in school have a different definition of correctness. They will say all sorts of things (even stuff "that everyone says") is incorrect. In business, there are certain mistakes that will cause people to think you are unprofessional (ex. their/there/they're). And so on. But since I'm interested in language learning and linguistics, I favor the linguistic definition of correctness. Maybe you are right, but I am a purist and I do not like even minor mistakes. What really irked me about your post was what you wrote about Polish people being proud of the difficulty of our language - we are somewhat proud as complexity and richness of language reflects ( I think) the wealth of culture. BTW your Polish is really good. I apologize if I insulted you - that was not my intention. I have watched both of the videos you posted. You speak very good Polish, congratulations. I have also read your comment about Polish as the hardest language to learn. I agree with you. When I read for the first time, in few places on the Internet, that Polish was considered to be very hard or the hardest to learn, I was confused. I'd rather say that Polish might be found hard or even the hardest in a Slavonic group, but I would not say it is the hardest among languages in Europe or in the World. I guess we can distinguish a group of complicated languages and place Polish in it. Nevertheless, Polish is not a lonely "language island", but is surrounded by other more or less similar languages of comparable vocabulary, grammar and some other sophisticated concepts (such as verb aspects or cases). As a Pole I must admit that, even though many people in Poland claim they speak English, most of them cannot speak neither right nor with pronunciation even close to standard. The latter may have even more consequences, because English pronunciation varies from the way words are written much more than in Polish. There are more exceptions, more rules and they do change the meaning! Most Poles, for example, cannot hear those "subtle" differences between "saw" and "sow" at all... According to this, for some, even "the easiest language" is the one which causes a lot of troubles. I'm just extrapolating from what I've seen with Czech, but I think the reason some native speakers think it's the hardest language in the world is from seeing foreigners only speak a few basic words of it, like you said. But from observing a lot of foreigners living in the Czech Republic, I would also say that most foreigners don't try. They usually see their time here as only a temporary stay, or in some cases as a working vacation that they just want to spend in the bars getting drunk with other English-speaking expats. Since I had an actual interest in the language, I put in the effort and over a year and a half have gotten to a level where reading the newspaper or trying sample university entrance exams is not difficult and I only have problems with literary fiction and films that use a lot of slang or regional dialect. I think it's mostly a question of the average learner's motivation than objective "difficulty." Yeah, I find the behavior of some groups of expats to be very strange! We were in Kraków, Poland for about a year. There were people who lived there for crazy long periods of time (ex. 5-10 years) who simply had no interest in learning Polish. Most of them were from Great Britian. On the other hand, there were other people who really tried to integrate. I met an Italian who lived in Poland for 7 years and a Korean who was only there for 2. Both spoke excellent Polish and no English. ;-) Of course, there were others, but they also spoke good English and it was difficult to avoid falling back on it when we were talking (especially if they were Americans). I'm a Polish native speaker as well and I completely agree with you. Difficulty is relative to your native language but also to your attitude towards learning. Lots of native speakers speak carelessly and incorrectly, but that's a problem with their attitude and not with the language. Also, the reason English is universally considered "easy" is because of the influence of the Anglo-sphere on the world. First, English is so prevalent that lots of words and expressions are already familiar even to beginners. Second, the standard of acceptable speech has been lowered by swarms of foreign speakers. For instance, it's acceptable to speak with a strong foreign accent as long as your grammar is OK. Actually, speaking with a perfect American or British pronunciation with correct stress, intonation, and so forth is extremely difficult for non-native English speakers. If you want an example of the difficulty check out this link. Aside from that I think you did make progress between the first and second video. The foreign accent is audible but your grammar is quite good and you seem much more comfortable speaking the language. A great link, thanks! I think you're right about the standard of acceptable English being relatively low. Living in the USA, I speak with non-native speakers everyday and so long as I can understand them, it's OK. :-) Even grammar and vocabularly mistakes are generally accepted. Yes, I think I did make progress between the videos. But the amount of progress was very different. In the first two years, I made a HUGE amount of progress and then recorded that first video. In the next three years, I definitely made progress, but not much compared to the first two. Particularly, in the last 1.5 years, my comfort with Polish has increased immensely. But I don't think any of the technical parts have changed much, ie. my pronounciation, grammar, vocabulary are all about the same. I agree that learning a second language is difficult no matter the language. However, I disagree that they are all equally difficult (or equally easy). The US state department has a long history of teaching foreign languages to their foreign officers (native english speakers) who staff the consulates. The course lengths (in hours of instruction) vary greatly depending on the language taught. Last time I checked, Korean took the most hours of instruction followed by Japanese. The slavic languages weren't far behind requiring over 1200 hours of instruction. Spanish and Italian were the shortest at 500 hours. German and French were also relatively short. Sir, you may not consider yourself a genius but there is no doubt that you have an amazing talent for language. You have mastered the language quickly. I have searched the last 5 years for a native english speaker who can speak a slavic language fluently and who's parents or grandparents were not native speakers. Or who was not a professor of the language. Invariably, just when I thought I had found someone, I would learn that either they learned the language as a youth, or were in academics. You are the first person I have encountered who as a native english speaker can speak a slavic language. Sir, you are in rare company. I have been studying and practicing Polish for 5 years and I cannot carry a conversation in Polish or read a Polish newspaper or book without significant translation. It is not due to a lack of desire or effort. I live in Georgia (USA) but I listen to Polish radio every day (radio Trojka) and I watch Polish serials on TV Polonia (both via the internet). I also attempt to read Rzeczpospolitika. I don't have anyone to converse with unfortunately. I will say, the older you become the more difficult it is to train one's mind to think in another language. That is my struggle. 42years of reading english literature has erected a very tall and protective fence around the language center of my brain. I am hammering at it every day but the fence is tall and thick. I have concluded that I do not have a talent for language but that has not impaired my effort. I will heed your advice with the utmost respect as I have learned that native Polish speakers struggle to teach non-native speakers the Polish language. My whole point is that the difficulty of a language depends more on who you are, than what the language is. I would contend that since the US state departments courses are geared at native English speakers, they are all from the perspective of an English speaker. If there were a course in Polish for native Czech speakers it would be much shorter. :-) The Polish language is always the same, but changing who the learner is, changes the difficulty. Of course, motivation is as much a factor as native language. But you can't adjust a whole course for personal motivation! You could do that in your personal study or with a one-on-one tutor, though. Does it count that my great grandparents were native speakers of Polish? :-) They passed away when I was really young and I can't recall ever hearing them speak Polish. To summarize: I've made several attempts to learn several languages and in all cases except the most recent one (Polish) I failed to learn to the language. But what I did eventually learn was how to learn a language, which is what helped me finally learn Polish. If I had an innate talent, I would have learned Spanish, French and Russian. But I didn't! Yes, the wall of "it should work this way because that's how it works in my language" can be very difficult to surmount - for adults of all ages, in fact. I think it actually has more to do with the mindset of the person than the age (although age can have an influence on mindset). I've known some 20-year-olds who can't seem to get over this wall and some 60-year-olds who have no problems! In any case, I wish you the best of luck! Stay in touch and let me know if there is anything I can help you with! I could make a linguistic argument about what a "mistake" actually is. :-) I know that teachers will obviously tell you that something is right or wrong. But according to linguists, anything acceptable to a native speaker is correct in their dialect. If your teachers rules disagree, it means either: (1) they represent a different dialect, ie. the standard language, which isn't the language spoken by the person speaking or (2) the language has changed since those rules were written (all languages are constantly changing!). thank you for your reply. I know that you don't disrespect Polish - nor any other - language. You know what, Polish language is not as flexible as e.g. English in terms of what is correct and what is not. There are obviously some cases where some words changed their meaning a little bit with time passing by, but by "mistakes" I meant something little bit different. There are some popular constructions which are using by many people in Poland and which are driving people like me crazy. And they are NOT correct even though. I'll give you one example: KAZAĆ and POZWOLIĆ. The first one means "to force somebody to do something" and the second one is "to let somebody do something". Many people use KAZAĆ as equivalent for POZWOLIĆ, which as popular, as... ridiculous. What is more, Polish orthography is a nightmare. I usually the only kid in my class who didn't have problem with it. There are pairs of phones which are read in the same way, but written differently. These are: H / CH, Ż/RZ, U/Ó and many more. ŻÓŁW (turtle) could be written as any combination of: (Ż/RZ)(Ó/U)Ł(W/F). Well, why couldn't the definition of kazać be changing? For example, in English the word "artificial" used to mean "beautiful" and now it means "fake." But while it was changing, both meanings probably existed and then one eventually died out. Dictionaries exist to describe the meaning of words as people use them. They don't perscribe what the meaning should be. If suddenly everyone started using kazać to mean pozwolić, then it's the dictionary that's wrong, not the people. That's the linguistic perspective at least. :-) I know that teachers would disagree. I think that the best solution for most problems is to find so-called "golden middle". Too much language freedom can be as harmful as being too strict. You are right about spelling in English. One of my favourites is QUEUE. Prawdę mówiąc jeszcze nie spędziłem zbyt dużo czasu nad wymową. To wyraźnie widać bo większość poprawek, którą dostaje w komentarzach, jest do mojej wymowy. :-) Np. zbyt dużo 'rrr', różnice między 'i' i 'y', itd. Ale na pewno kiedyś spróbuj jeszcze raz! For you, probably English and Spanish are the most difficult. I'm Polish and I do not think that is the most difficult language but I'm sure it's in the top five most difficult languages ​​in the world. I'd like to hear your good Polish language. For example, as you say Grzegorz Brzęczyszczykiewicz. I think that you have no idea what you're talking about. Oczywiście wiem kim był Karol Wojtyła. :-) Według Wikipedia nauczył się 12 języków. Ale niestety nie wiem iloma posługiwał się biegle. W każdym razie był wyjątkową osobą z wielu powodów! anyway I am very weak in English but i do not think anyone has been able to learn Polish in such a short time, of course, at the same level as my English. Maybe not so great but I can communicate in five languages​​, I am 28 years old. Congrats! I hope to one day learn as many languages as you. :-) So far I can only speak three including my native language. I wish you success in your future endeavors! 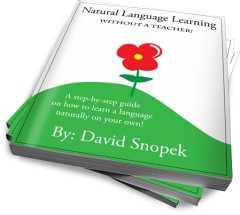 I was wondering if I could have your email address so I could ask you a couple questions on how you've been so successful on learning the Polish language. My girlfriend of 6 years is Polish and I'd like to see what techniques you've used. Or if you're a subscriber, you can just hit reply to any of the e-mails I've sent you! I already discuss how I learned Polish pretty extensively in my ebook and on this blog, but if you have a specific question about the techniques that I used I'd be happy to answer it! At start I would sorry 'couse my English isn't the best and probably there will be many mistakes. Ok, now I'm upset. *upset polka mode on* Ok, I'm only joking. Let's start that people from Poland often are being popular in internet. We have some kind of power on this area. For exaple: we were in Twitter's Top Sth when ours teenagers wanted One Direction to have concert in Poland; In YT I would many times see things like "Polska przejmuje filmik! "("Poland takes over the video! "), so maybe you could see informations like that, but I don't think it's the hardest. Polish isn't easy language to learn and even our people can't speak perfect. You are/was learning this, so you should know about many grammatical form to only one word, letters with the same speaking(for example: ż-> rz; h-> ch;) etc. And one of my nightmares - polish interpunction. There are languages what, like German, heve simple rules, but Polish not, BUT in almost all the lists of the hardest languages Polish was on end(if was) and under the Hungarian! It's always categories "the hardest 'couse of:...". One language have diffrent speech then spellings, other have 'strange' letters(Japanesse)and other something else. . .
"Most Polish people are simply amazed when a foreign can speak any Polish at all. My Polish is good, but not perfect. Yet I constantly get over-the-top compliments about it! If Polish is "the hardest language in the world" I must be a super genius, right? I wish! I'd love to believe that but it simply isn't true." Now I will show you my point of view. If I would met you I would be amazed, too, but mostly because of what you WANTED to learn THIS language and you've SPEND so many time of THIS language. Unlike German, English or Spanish it isn't language you can use in many places. We are not that strong like before and our people are going to other countries, but hardly ever opossite(yes, in this point I would start conwersation about polish government). Genius? Ha, I don't think like that. Some people's brain is better in languages, other in math. You don't have to be a genius to put your energy in learning. "The perceived difficulty of Polish is a point of national pride." For me it's not all because of difficult, but maybe a history. Maybe you was something learning about polish history on your own and know that our past wasn't that simply. Our grandparents were dying for this country and language. It wasn't that long time ago and I don't think I'm the only one that is pround of this country and language 'couse so many people that were fighting. If not they I would talikng in German or Russian right now. But, after all, why not be pround 'couse of difficult? I would like to develop this topic, but I don't think my English is that good. Ups. "I have a theory, that all languages are equally hard." "Every single Polish child, even the not-so bright ones, learn Polish." But it's not that easy to aduld human. Children learns really fast in their earlies. I don't remember so good now, but I was reading about it. When we were... I don't know... Maybe 3 years old, we could learn so much in year like now in 3 years for exaple. And if one of parents was born in France, the second in Spanish, child really often would know both language perfect, right? But when people are older they have to spend a lot ofmore time to learn only one foreign language. Once again: sorry for all my wrongs. Some languages are on the deep end when it comes to hardness, but for the most part, most are in the middle. Chinese has tones and logograms, but no morphological grammar(no tense, declension, conjugation, or anything) while English has a simpler morphological grammar than most IE languages but has difficult spelling, consequently, Spanish has many subject verb conjugations but it is very phonetic. Oh, and to the above poster: your unfamiliarity with Chinese does not make it hard in comparison to English which you claim has "basic letters" despite the fact vowels are out of place. I may of misread what you've written, (Chinese sings? what?) but be humble with what you think you know. I would say it doesn't depend on what language but rather who is about to learn it. First of all, learning any foreign language requires patience. That's, I believe, beyond any doubt. I find many people struggling even with some basic concepts, but only because it's very hard for them to express themselves in their native language. Well, that's of course only one of the reasons, but I think it's one of the most significant for sure. I myself, being a Pole, was trying to catch up some of the 'Slavic' languages and found out that since I can read Polish, I can also read Croatian, because it sounds exactly the same (couple of different characters, but still have their Polish equivalent and only a little bit different pronounciation of letter 'L'). So I should say - hey, Croatian is so easy, but it becomes tricky in other aspects, as the Polish 'lipiec' is Croatian 'srpanj', and Polish 'sierpień' is their 'kolovoz'. And I found myself being more interested in Scandinavian languages, even if they're not even related to Polish, and I think they're 'easier', just because I put much more emphasis on them and feel like I'm actually acquiring more and more with every new word or sentence I see and try to translate it myself. But it is great that you had a lot of patience to learn Polish. And as you probably know, people in Poland are actually really happy to hear their language spoken by a foreigner and are very helpful in expressing his or her thoughts. But it only means we just care for our language, dosn't mean we think it's the worst to learn at all. Although for some reasons we do have that feeling, that it is easier for a random Pole to learn English, than for random English guy learn Polish. Thanks! I agree with everything you wrote ... except for one thing: "it is easier for a random Pole to learn English, than for random English guy learn Polish." Most people in Poland who speak English have been learning it for a very, very long time. I've met people who were only in their twenties but claimed to have been learning English for 15 years! I know that most of that time was very light learning, however, it gives Poles a huge advantage having had familiarity with English for so long. I personally beleive if we got 100 Poles who never heard English, and 100 Americans who never learn Polish, and they started learning at the same time - on average they would have similar levels of success. Of course, I've never done that experiment! :-) So, it's just my personal feeling. In any case, I absolutely agree with the main point of your comment which was: "it doesn't depend on what language but rather who is about to learn it." Thanks for again for your comment! But the point is that - and this is just my little kind-of-experience among my, let's say, neighbours - people in Poland are learned foreing language mostly just to learn it (sounds silly, huh?) rather than TO USE it. I myself to keep up the attention just have to watch some american movies, sitcoms, even the most stupid ones, but it gives me the feeling of real language, not the one from the typical high school classes, that always seemed to me a bit dull, actually. Poprosiłbym o linka do tych badań (badań, a nie do opisu badań w jakiejś gazecie), ale jestem pewien, że nigdy ich nie widziałeś. Czemu więc się powołujesz na coś, co nie istnieje? A skąd wiem, że nie istnieje? No bo to nawet logicznie się nie trzyma kupy. Trzeba by zacząć od definicji co to znaczy "nauczyć się". 100% się nie pozna nigdy. To, co opisujesz, działa w drugą stronę. Pierwsza myśl: jak przetłumaczysz "taker" (rzeczownik odczasownikowy powstały z "take")? Wiesz, kradnie złodziej, a bierze... bracz? Twój przykład nie jest napisany w języku polskim, stąd co w tym dziwnego, że obcokrajowiec nie zrozumie? W poprawnym polskim też napiszesz trudne zdania, ale spróbuj bez sprawdzania powiedzieć co znaczy np. "Buffalo buffalo Buffalo buffalo buffalo buffalo Buffalo buffalo" albo "James while John had had had had had had had had had had had a better effect on the teacher". W przeciwieństwie do Twojego przykładowego bełkotu, któregoż i ja nie rozumiem, podałem dwa poprawne zdania w angielskim. I co, to jest dowodem, że "nie można nauczyć się" angielskiego? Ten Twój przykład nie zostanie zrozumiany też przez Polaków, bo z powodu błędów można interpretować to w różny sposób i każdy zrozumie jak chce, stąd nie ma sensu się nad nim zastanawiać, bo i tak tylko Ty wiesz, co chciałeś przekazać. Tak jak angielskie zdanie (przykład z internetu) "Who you got them likings of?". Jest niepoprawne, ale można doszukać się sensu. Tylko każdy znajdzie inny sens.